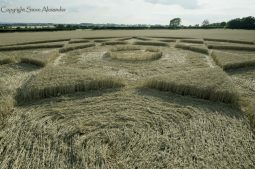 The Rollright Stones are a ring of relatively small standing stones. 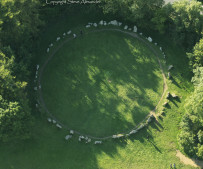 According to folklore, the stones are a king and his courtiers, petrified into stone by a witch! 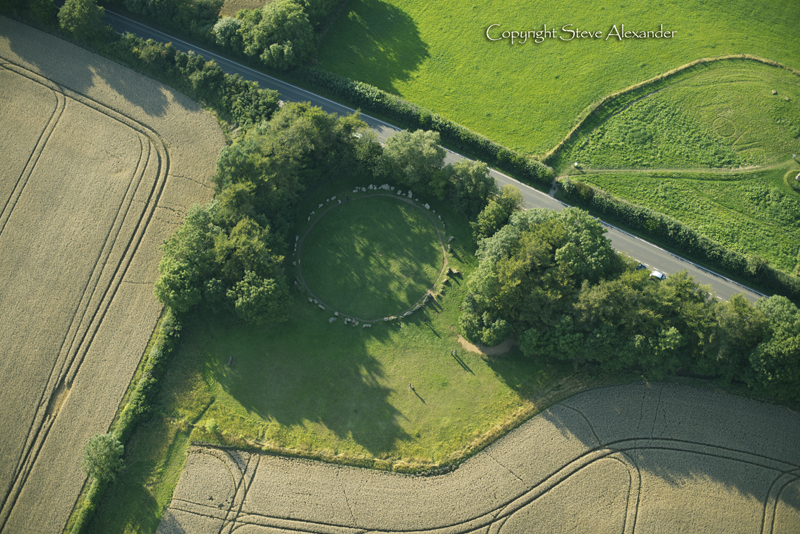 In addition to the stone circle there are two other stone monuments nearby. The stone circle sits right next to a road, and on the other side of the road is a single standing megalith called the Kings Stone. 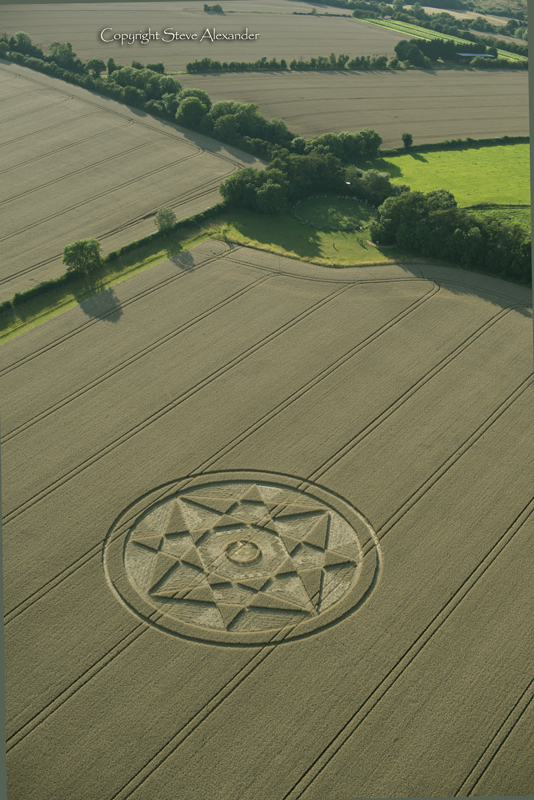 Interestingly, although only over the road (literally), this stone lies in the county of Warwickshire – the road marking the boundary between the counties of Oxfordshire and Warwickshire. 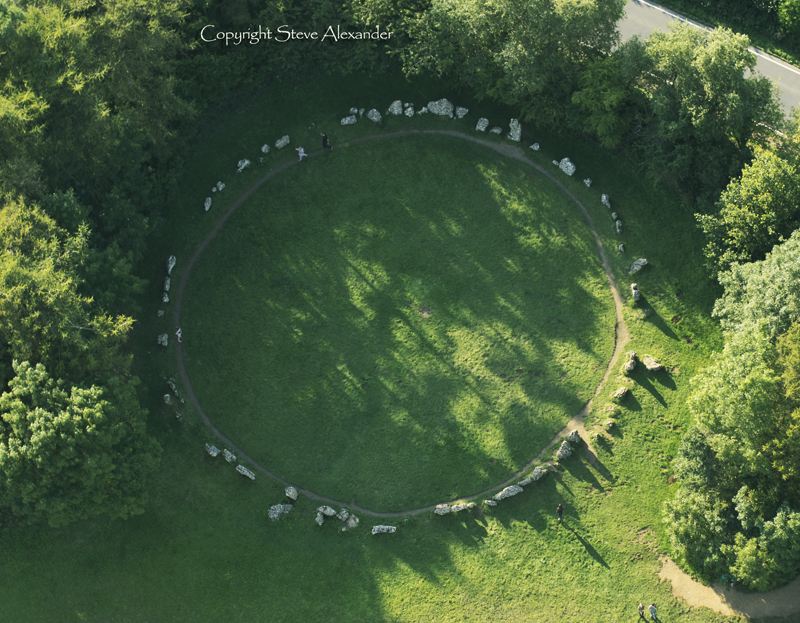 The third stone monument is a dolman called the Whispering Knights – so named because of the way the stones lean into one another in a ‘conspiratorial’ posture. 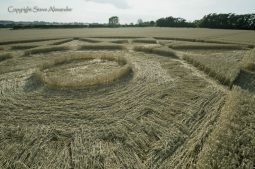 You can read much more about the Rollright Stones here. 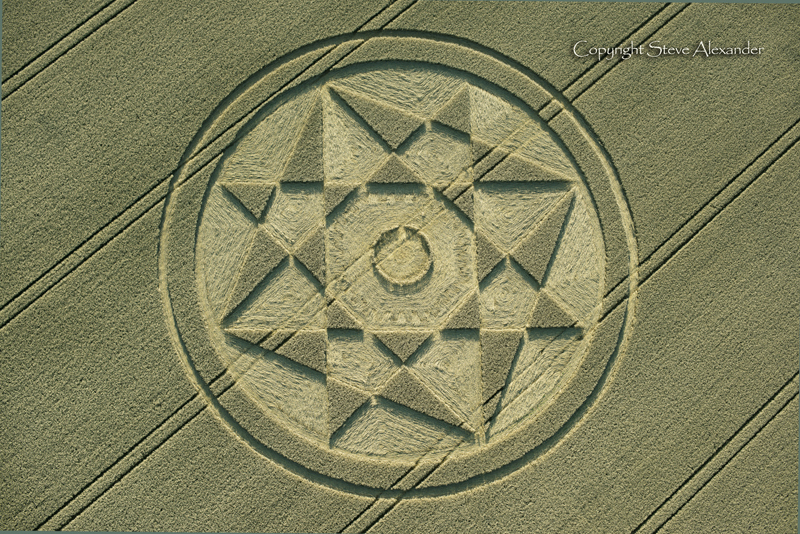 There have been circles at this location before, the last time in 2015. 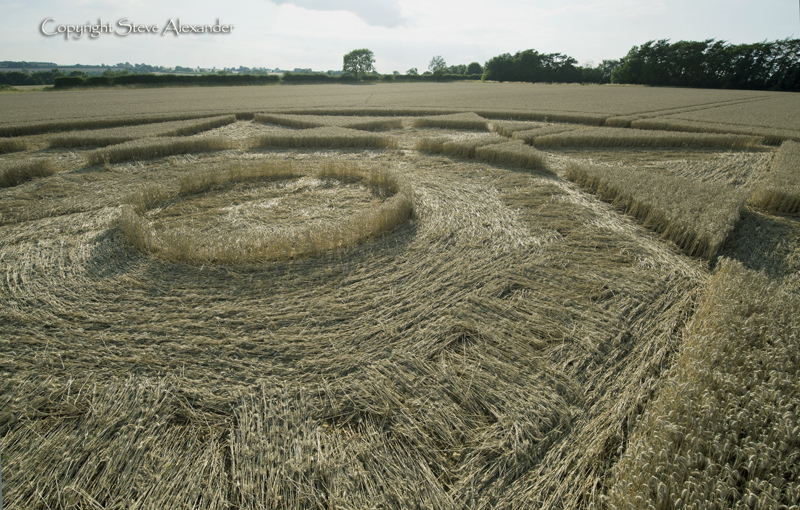 It is a very lovey location and well worth a visit if you can get there. 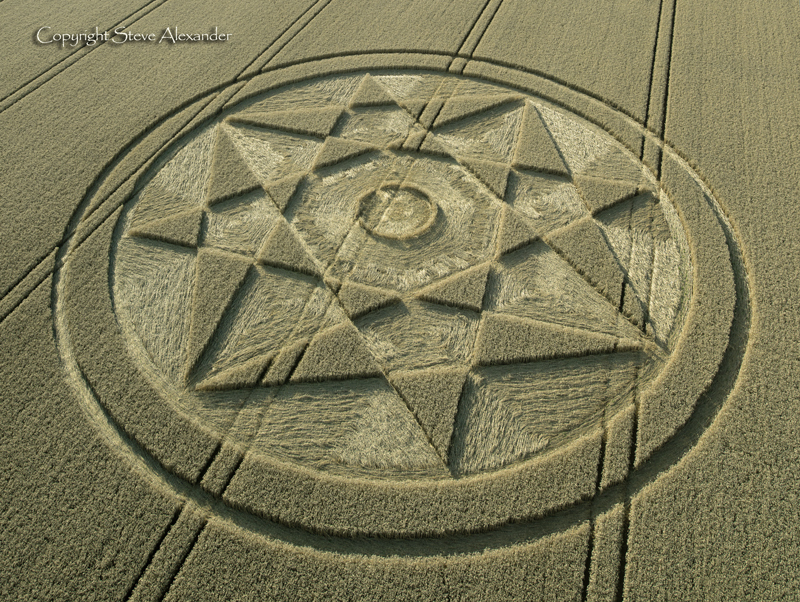 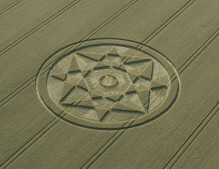 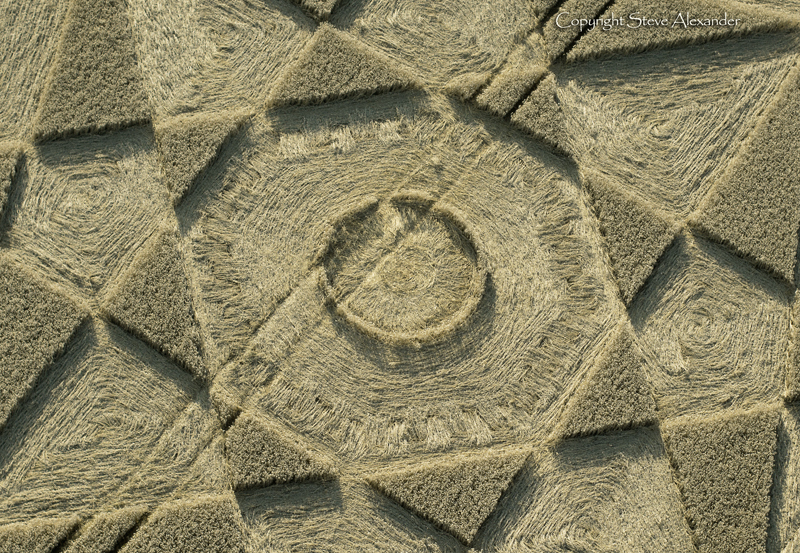 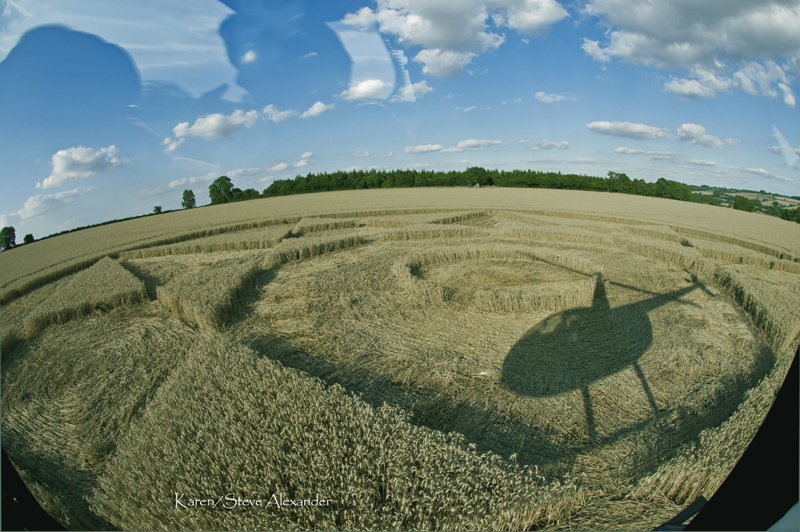 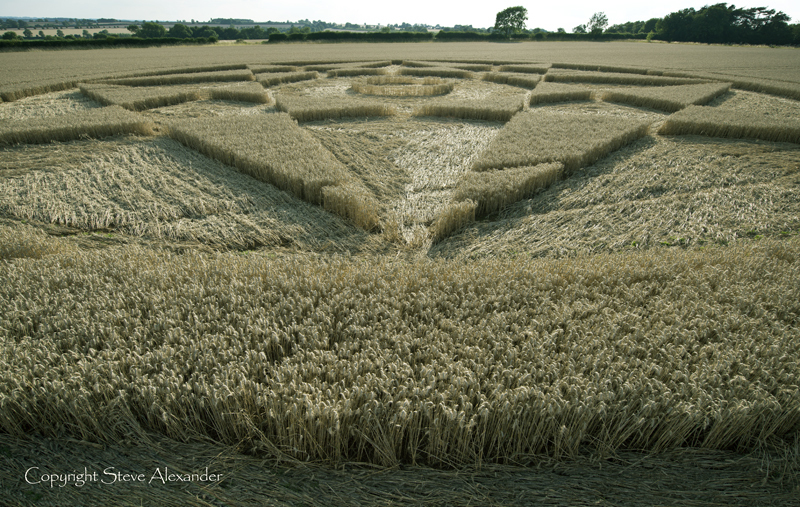 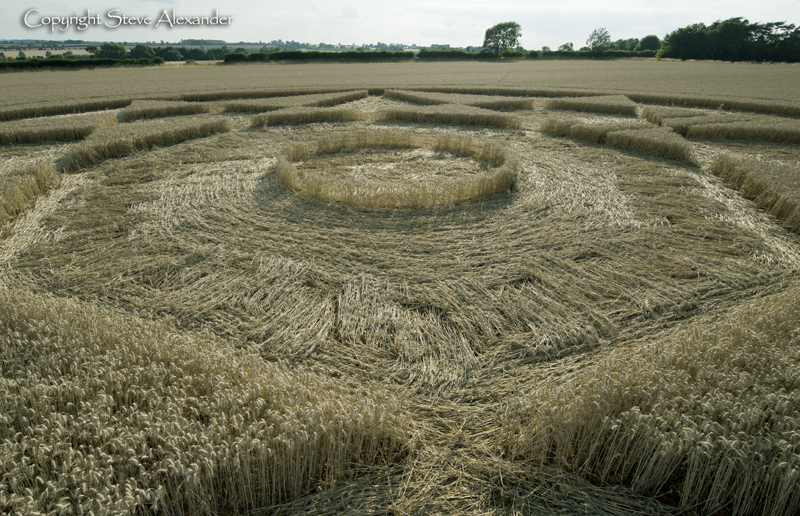 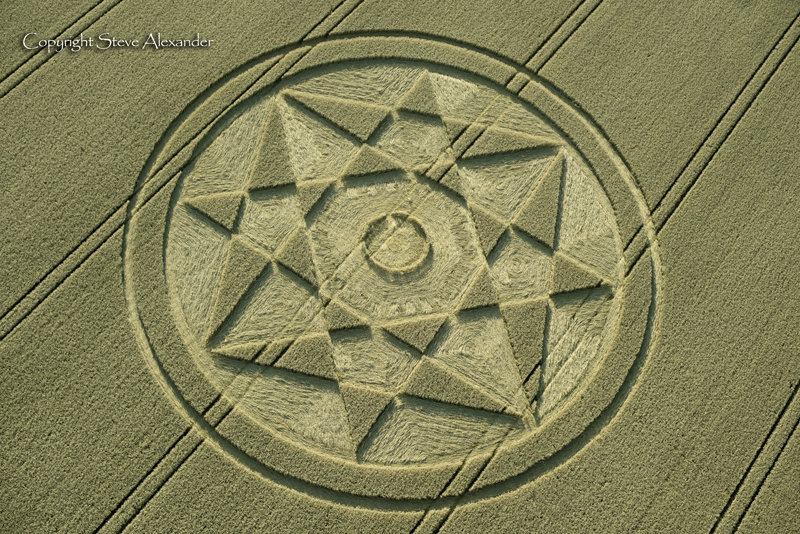 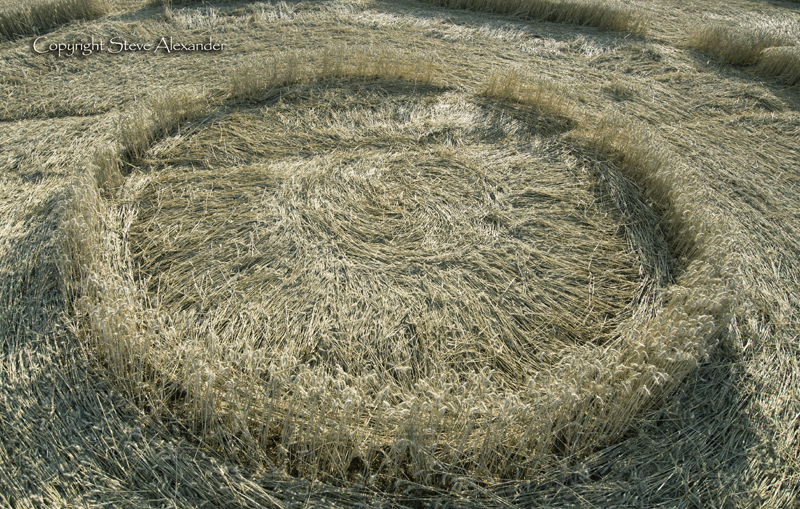 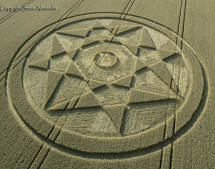 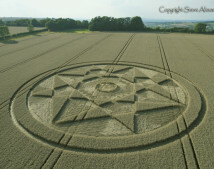 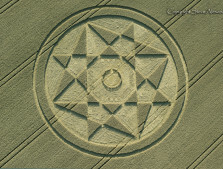 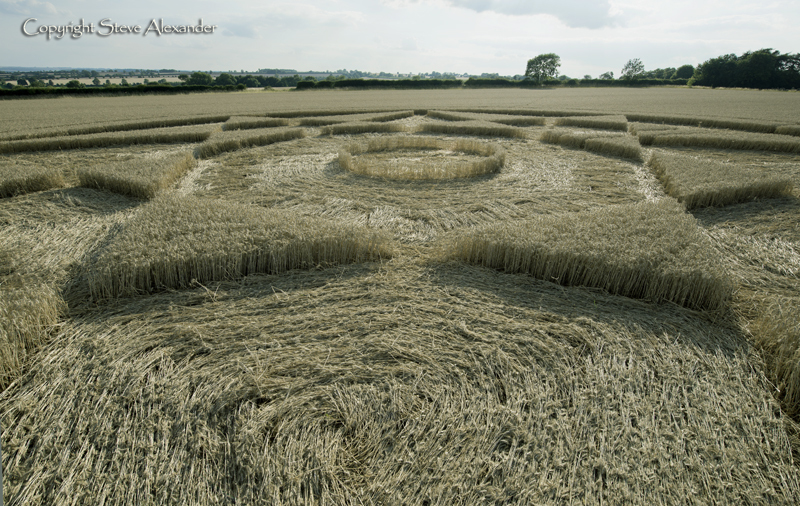 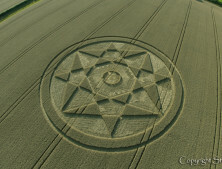 The circle here measures approximately 180ft-200ft in diameter and is in a field of golden, mature wheat. 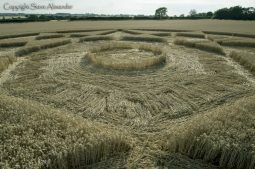 There are several noteworthy features to this circle, the first of which is the weaving of the crop close to the centre of the formation and the very fine ring of standing stems which create the most delicate of enclosures for a radially laid centre circle. 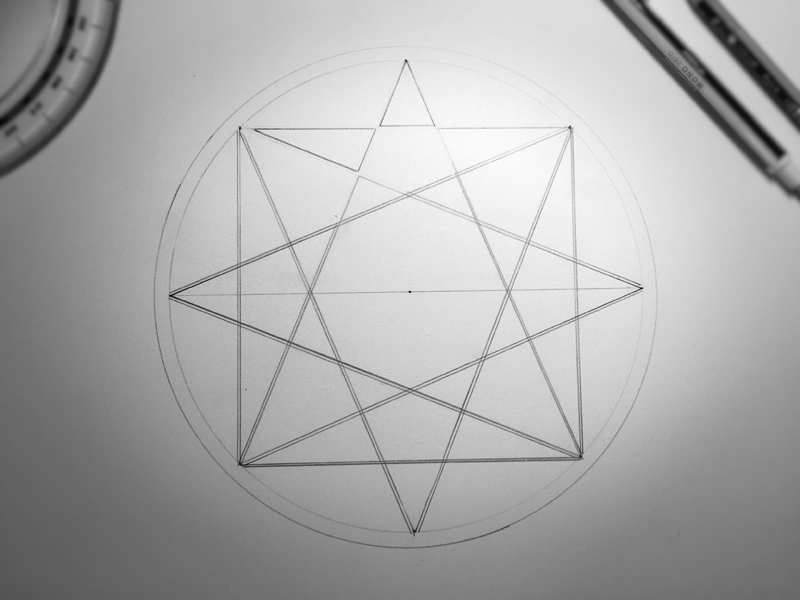 The second is the fascinating geometry; a marriage of eight and five. 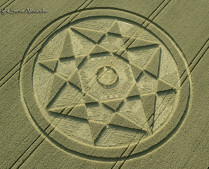 Eight and five are two sequential Fibonacci numbers and two of the most prevalent found in nature, followed by thirteen. 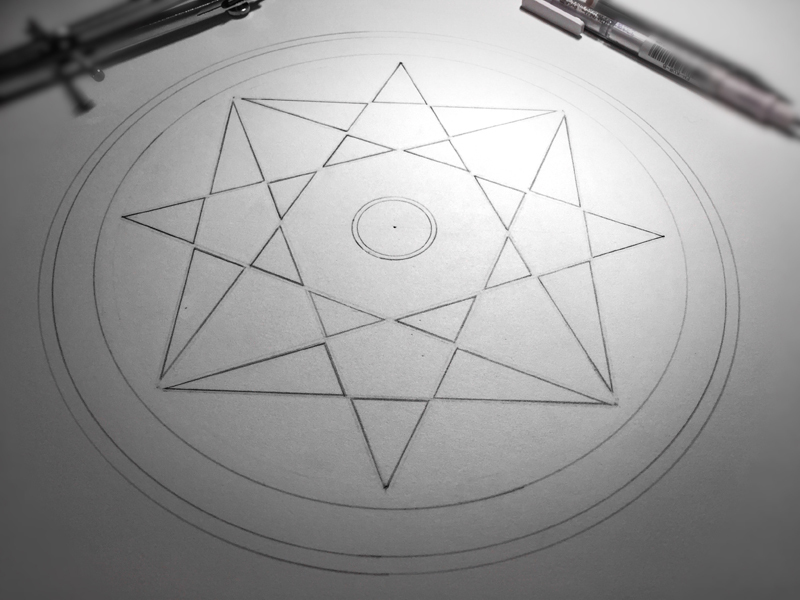 If five and eight are here, I wonder where thirteen is – that’s for the drawing board! 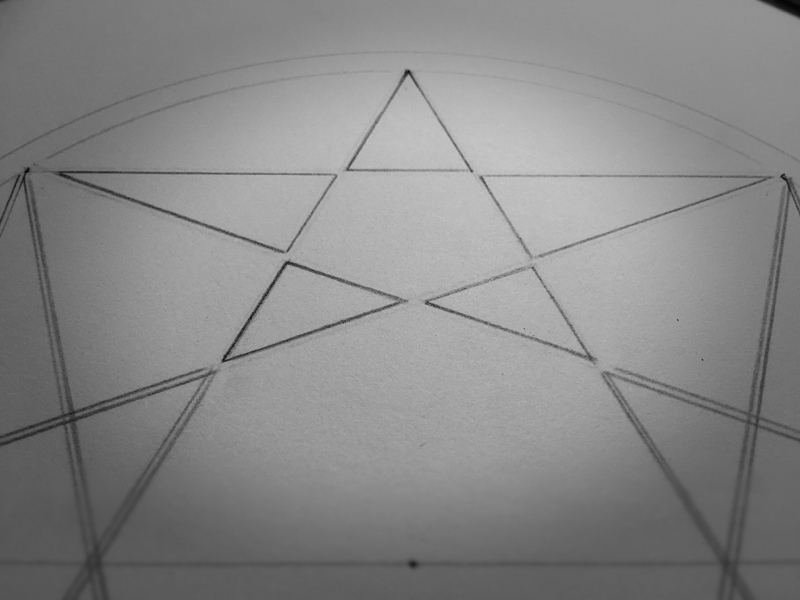 I love the ‘stretched’ pentagrams in this pattern, their marriage with the octahedron and octogram (made from two overlapping squares) is great fun – the playfulness with shape is really edifying. 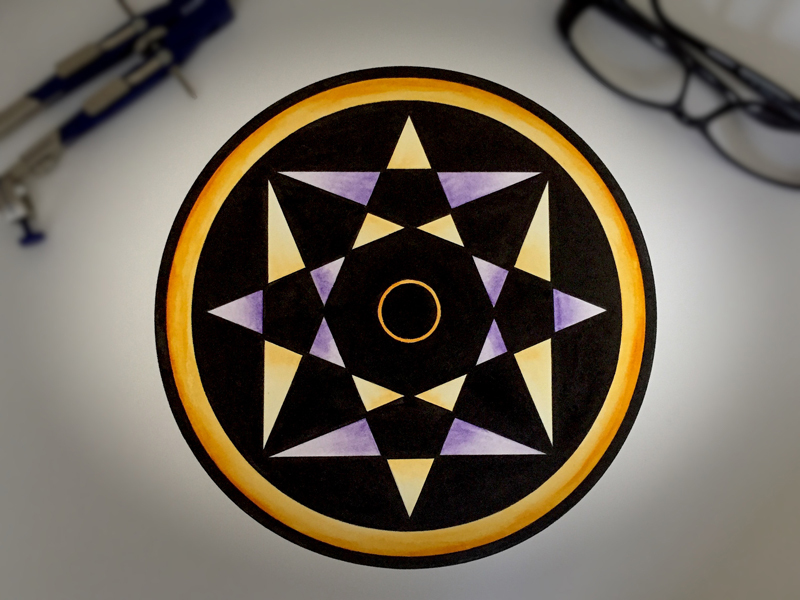 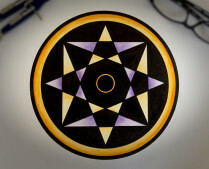 This will be a great circle to draw. 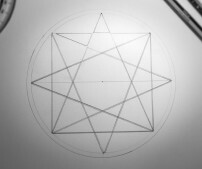 Five is the number of life and the pentagram star is the the generator of Phi par excellence. 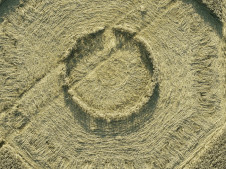 It is connected with regeneration and it is also connected with water through its molecular structure. 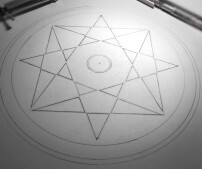 This marries well with eight which is about periodic renewal, and the link here is best illustrated by the sounding of the octave after playing the musical scale, the octave simulatenously taking us back to the beginning, but of course at another level (or scale). 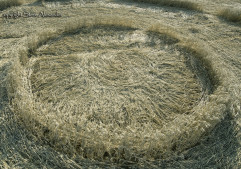 I am left wondering of this circle was as fizzy and energetic on the ground as its geometry suggests! 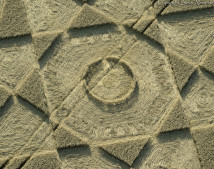 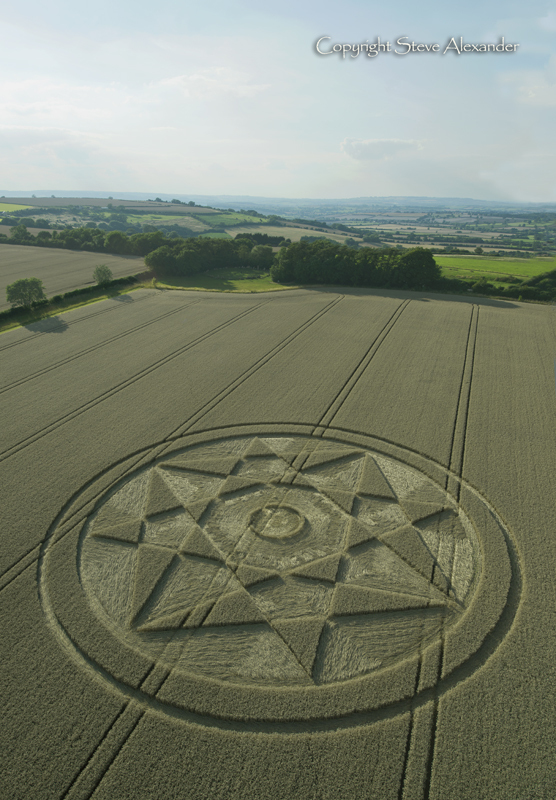 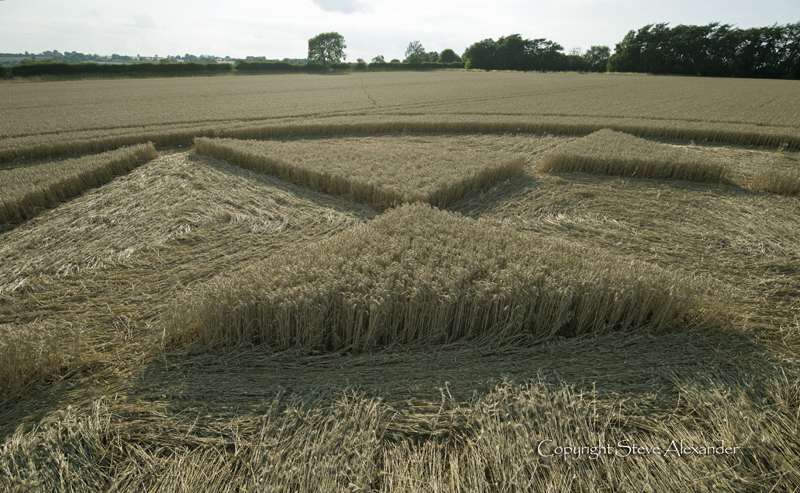 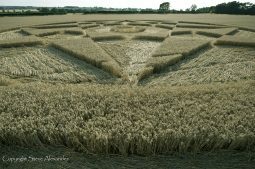 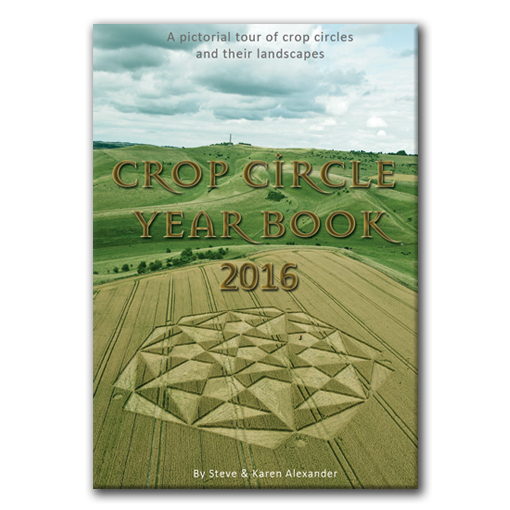 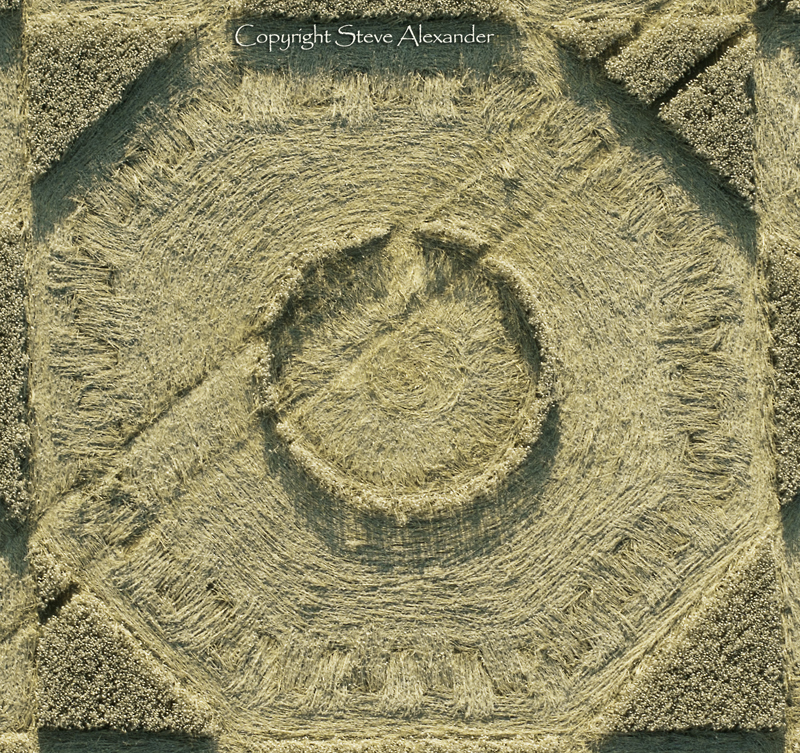 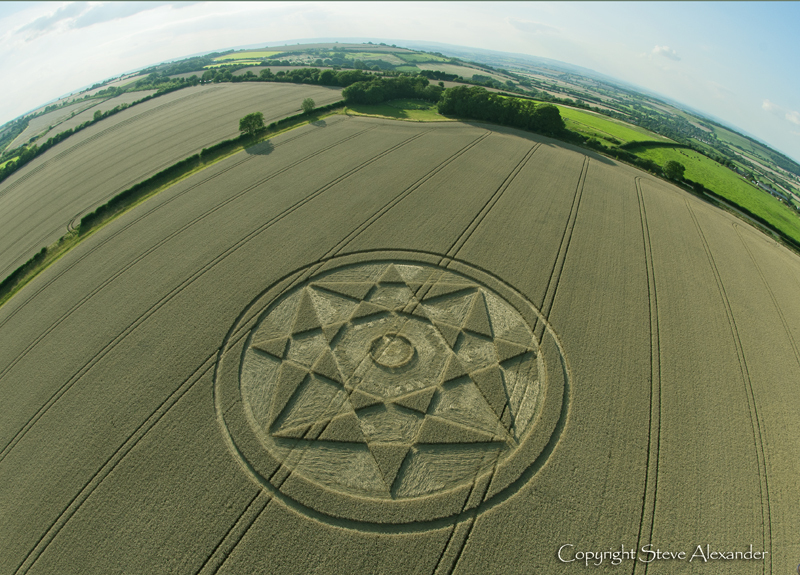 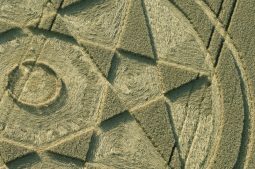 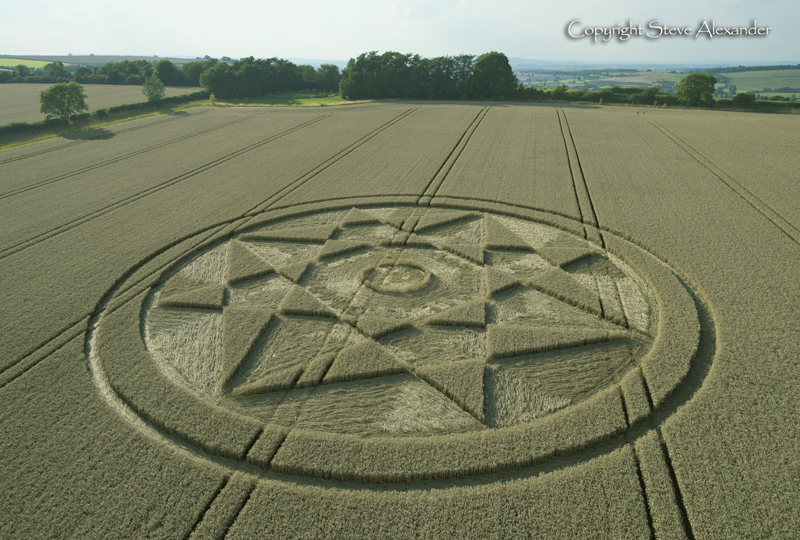 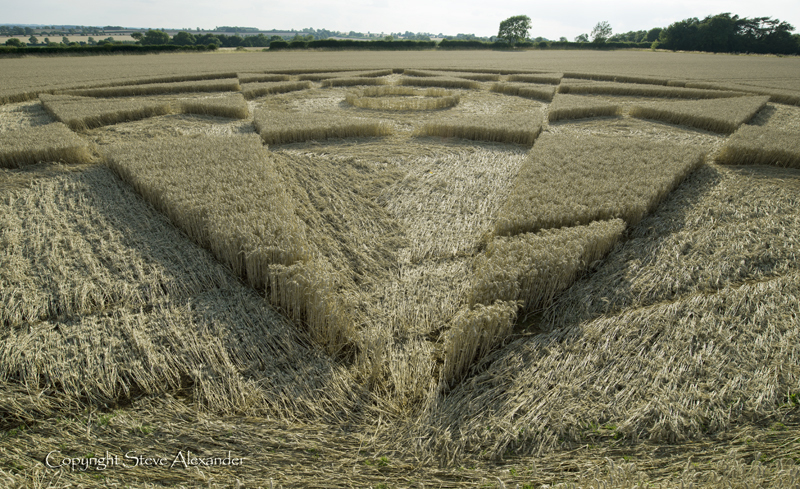 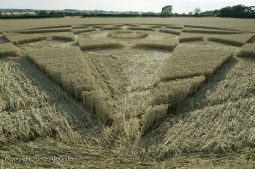 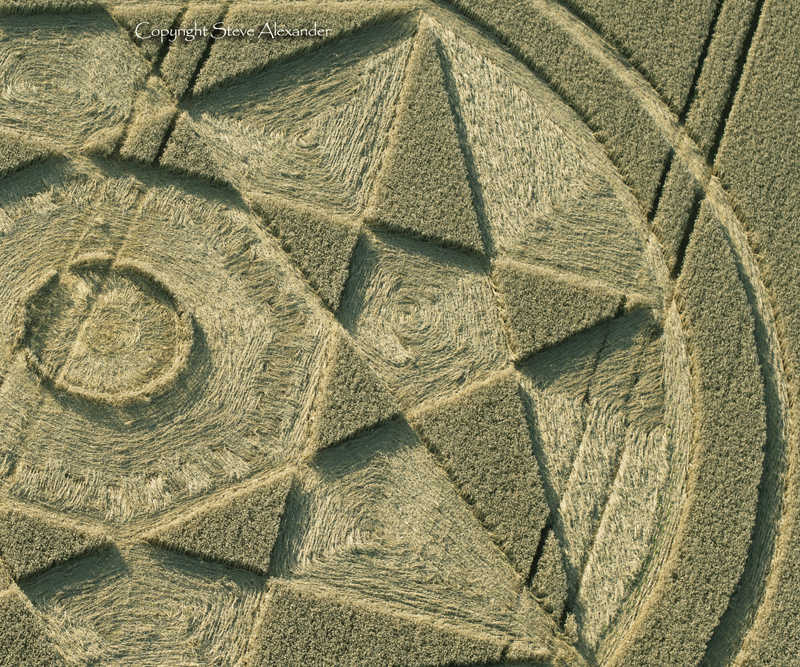 Photographic Enlargements: are now available of many of the 2017 crop circles click here to see our fantastic range. 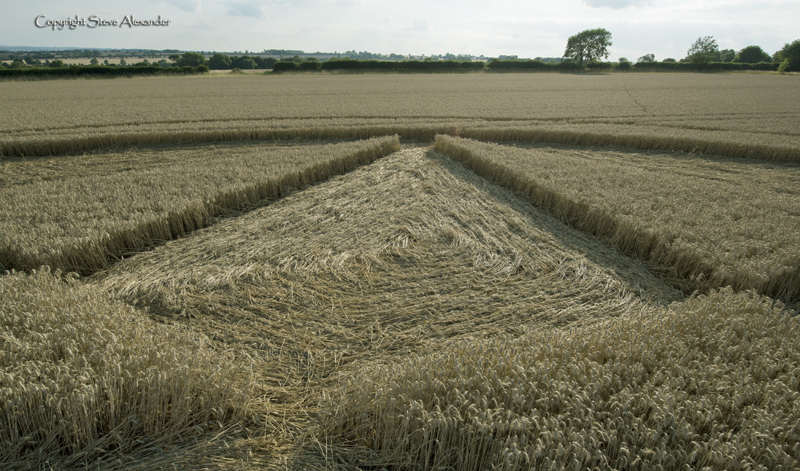 Visiting: This circle has now been harvested. 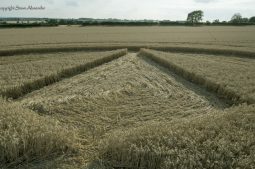 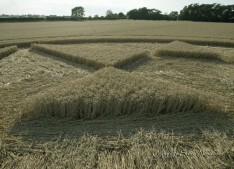 The farmer has now put a sign up at the side of the field asking visitors not to enter the crop circle. 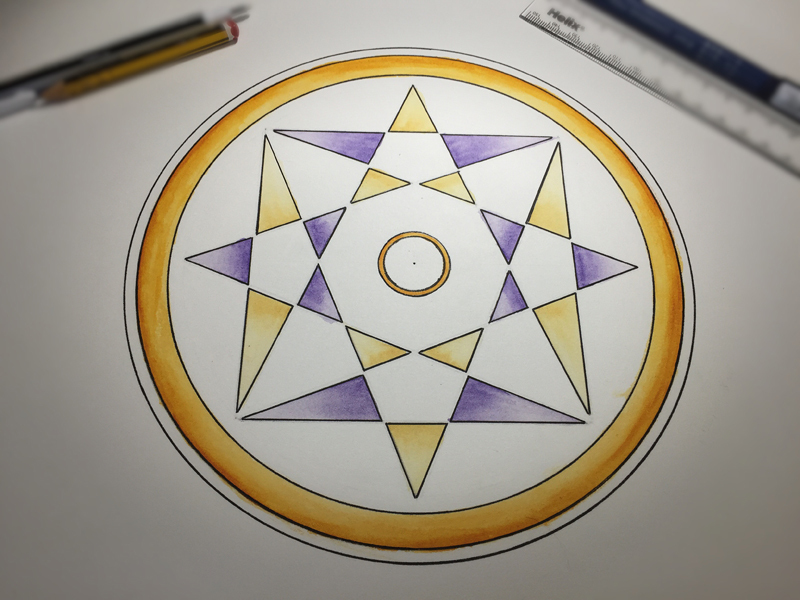 Please respect his wishes – thank you. Please Help to keep us Flying in 2017: If you have enjoyed looking at our pictures and information please consider making a small donation to keep us flying. 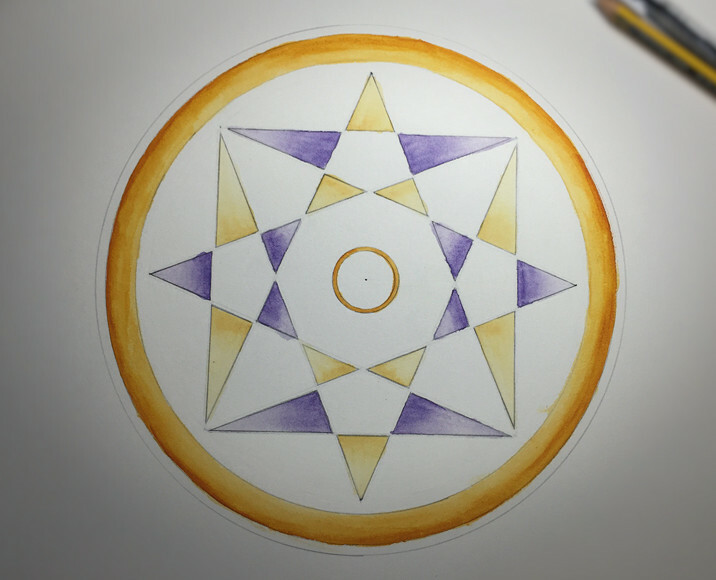 There are so few of us left regularly recording the circles it’s really important that we continue. 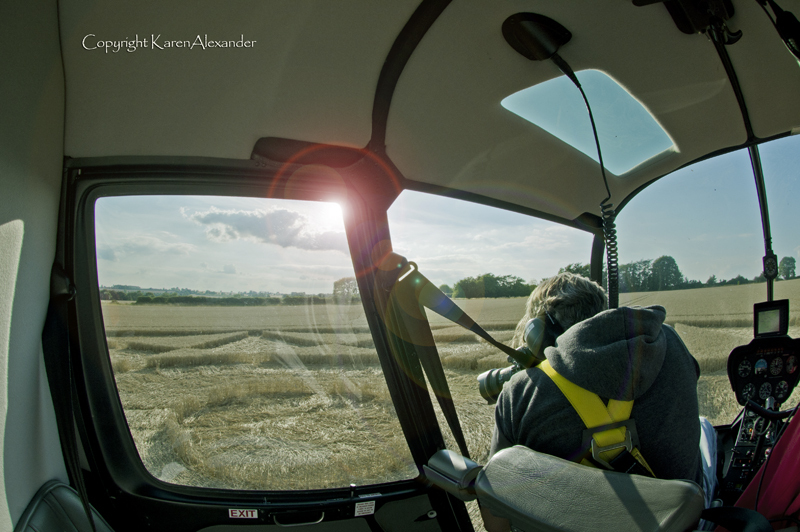 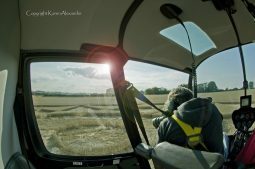 And while some now use drones to record the circles, it is important that there are still images taken from aircraft where the best quality camera equipment can be used and images that include the broad vista of the landscape can be taken. 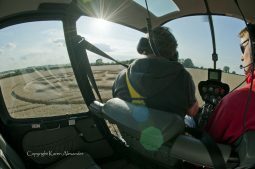 This kind of photography is expensive and it gets harder with each passing year to raise the funds we need to continue our work, but if everyone who regularly looked at this website made a small donation we would meet the funds we need. 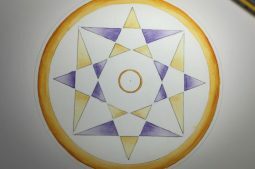 You can make a donation here. 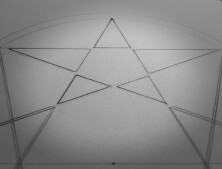 Five is the number of life and the pentagram star is the the generator of Phi par excellence. 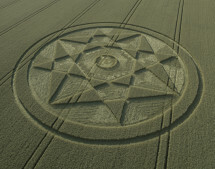 It is connected with regeneration and it is also connected with water through its molecular structure. 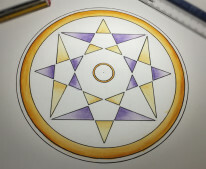 This marries well with eight which is about periodic renewal, and the link here is best illustrated by the sounding of the octave after playing the musical scale, the octave simulatenously taking us back to the beginning, but of course at another level (or scale). 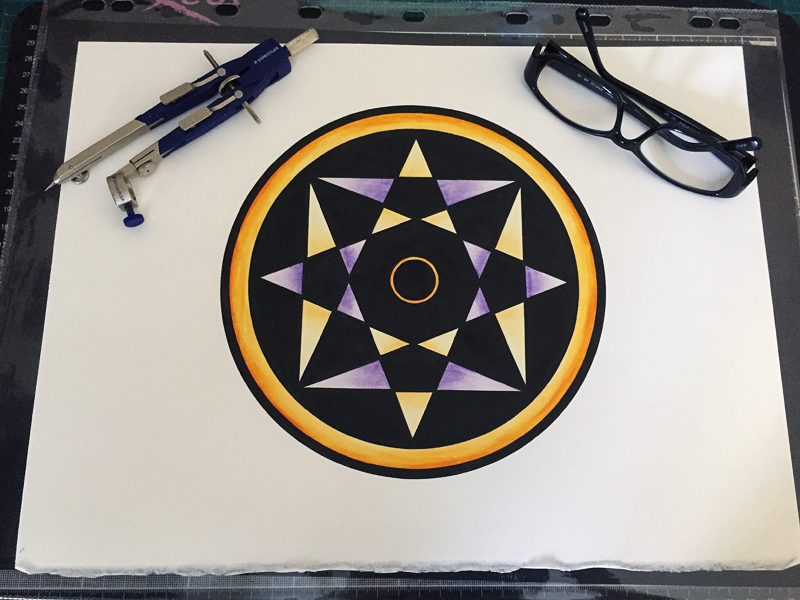 Karen currently has a section of her original paintings (2017) for sale. 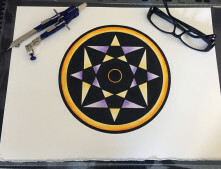 Click here to see the paintings available.